The structure of living organisms comes in gradual levels. These levels begin with the systems, then include organs, tissues, cells and finally organelles. If we follow up this structural sequence of living organisms, we will find that the cells of any living organism are made up of organic and inorganic molecules, and each of these molecules is made up of atoms. Inorganic molecules in living organisms, such as water and salts, often do not contain carbon atoms. While organic molecules, such as carbohydrates, lipids, proteins and nucleic acids, are large molecules containing carbon and hydrogen and are called biological macromolecules. Most biological macromolecules are called polymers. Polymers are made up of a combination of smaller molecules called monomers through a process called polymerization. – Deoxyribose sugar involved in the composition of DNA. – Ribose sugar involved in the composition of RNA. A phosphate group. These are connected to the carbon atom number 5 of the sugar molecule. A nitrogenous base. Nitrogenous bases are: adenine (A), guanine (G), cytosine (C) and thymine (T) in a DNA molecule and uracil (U) in a RNA molecule. Uracil is found in RNA only instead of thymine in DNA. Each base is connected to the carbon atom number 1 of the sugar molecule. Nucleic acids differ with respect to the difference of the nitrogenous bases forming them. Nucleic acids are carried on the chromosomes inside the cell’s nucleus. They are responsible for passing on the genetic traits from one generation to another when cells divide. DNA carries the genetic information responsible for creating the distinctive characteristics of the living organism and organises all the vital activities of the cell. On the other hand, RNA is transcribed from the nucleic acid DNA and transferred into the cytoplasm to be used by the cell to synthesise the proteins responsible for creating the genetic traits, and those responsible for organising the vital activities. Deoxyribonucleic acid (DNA) is a nucleic acid containing the genetic instructions used in the development and functioning of all known living organisms. The DNA segments carrying this genetic information are called genes. Likewise, other DNA sequences have structural purposes or are involved in regulating the use of this genetic information. Along with RNA and proteins, DNA is one of the three major macromolecules that are essential for all known forms of life. DNA consists of two long polymers of simple units called nucleotides, with backbones made of sugars and phosphate groups joined by ester bonds. These two strands run in opposite directions to each other and are, therefore, anti-parallel. Attached to each sugar is one of four types of molecules called nucleobases (informally, bases). It is the sequence of these four nucleobases along the backbone that encodes information. This information is read using the genetic code, which specifies the sequence of the amino acids within proteins. The code is read by copying stretches of DNA into the related nucleic acid RNA in a process called transcription. Within cells, DNA is organised into long structures called chromosomes. During cell division, these chromosomes are duplicated in the process of DNA replication, providing each cell with its own complete set of chromosomes. Eukaryotic organisms (animals, plants, fungi,and protists) store most of their DNA inside the cell nucleus and some of their DNA in organelles, such as mitochondria or chloroplasts. In contrast, prokaryotes (bacteria and archaea) store their DNA only in the cytoplasm. Within the chromosomes, chromatin proteins such as histones compact and organise DNA. These compact structures guide the interactions between DNA and other proteins, helping control which parts of the DNA are transcribed. Ribonucleic acid (RNA) functions in converting genetic information from genes into the amino acid sequences of proteins. The three universal types of RNA include transfer RNA (tRNA), messenger RNA (mRNA), and ribosomal RNA (rRNA). Messenger RNA acts to carry genetic sequence information between DNA and ribosomes, directing protein synthesis. Ribosomal RNA is a major component of the ribosome and catalyses peptide bond formation. Transfer RNA serves as the carrier molecule for amino acids to be used in protein synthesis and is responsible for decoding the mRNA. In addition, many other classes of RNA are now known. Artificial nucleic acid analogues have been designed and synthesised by chemists and include peptide nucleic acid, morpholino and locked nucleic acid, glycol nucleic acid, and threose nucleic acid. 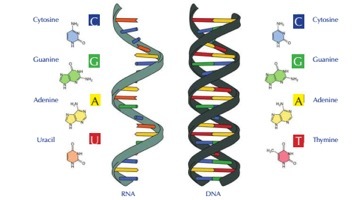 Each of these is distinguished from naturally occurring DNA or RNA by changes to the backbone of the molecules.